Overview - Two determined mothers­, one a teacher, look to transform their children's failing inner city school. Facing a powerful and entrenched bureaucracy, they risk everything to make a difference in the education and future of their children. As the son of a teacher, stories about the education system usually hit pretty close to home for me. My mother worked in the Miami-Dade public school system for thirty one years, and as such I've heard my fair share of horror stories dealing with the many frustrating struggles that teachers, parents, and students are forced to face. With that in mind, I was optimistic that 'Won't Back Down' might offer a thoughtful peek into these very important and relevant issues. Unfortunately, the film mostly misses the mark. The movie tries to be stirring and emotional, but its simplistic approach lacks real insight. It's a well meaning effort, but the results are muddled by trite plotting and stale characterizations. Jamie (Maggie Gyllenhaal) is a struggling single parent raising a dyslexic daughter named Malia (Emily Alyn Lind). When Malia is placed in a failing school that seems content to let her slip through the cracks, Jamie decides to take matters into her own hands. Joined by a frustrated teacher (Viola Davis), she attempts to seize control of the school, hoping to turn it around herself. Faced with strong opposition from parents, educators, and the teachers union, the two enact a grassroots effort to try and sway their detractors, wishing to convince them that they're qualified to run the school... despite the fact that, you know, they clearly aren't. The story is loosely inspired by actual cases involving the Parent Trigger Law (which allows parents the right to overhaul schools that are underperforming), but the script essentially follows a tried-and-true inspirational film formula. Director Daniel Barnz offers a few effective stylistic techniques, including sustained moving shots and a gradually shifting color palette, but overall this is a standard effort that rarely distinguishes itself from the pack. Faced with seemingly insurmountable odds, the narrative follows the two protagonists as they slowly find hidden strength and overcome adversity. All the while, the pitfalls of our current education system are examined to varying degrees of success. While there's certainly merit in the core of the story, the execution ends up being rather dull. Despite numerous attempts to inspire and uplift, the characterizations are all thin, relationships are mostly underdeveloped, and many scenes get bogged down by expository dialogue. Likewise, the protagonists never elicit the kind of emotional bond necessary to overcome the script's simplistic and potentially ill-advised goals. I usually admire Maggie Gyllenhaal as an actress, but here she isn't very engaging or even likeable. The character is passionate but erratic, and while her heart is in the right place, I found her behavior to be more grating and irritating than inspirational. Viola Davis fares a little better, but the two don't ever make for a particularly rousing duo. I really wanted to be caught up in their cause, but their unrealistic and seemingly misguided endeavors never hit the intended chord. Instead, I was often left perplexed and unconvinced by their supposed plan (or lack thereof). The root of this disconnect stems from the fact that we don't really see how the characters would actually go about implementing positive change in the education system. We're told that the school is failing and that these two women somehow know how to solve the problem, but there's little on-screen evidence to support the idea that they truly have any clue what they're doing. The sentiment behind their motivations is sound, but the filmmakers' implementation of the idea is a bit farfetched and naïve. Likewise, the script sort of loses sight of what the characters are fighting for in the first place, ignoring the students' struggles in favor of focusing on conflicts dealing with bureaucracy. With the exception of one fleeting scene, we hardly ever see Davis in action as a teacher, and our peeks into the classroom are far too brief to ever create any kind of emotional investment in the school's plight. Attempts are made to offer a nuanced examination of the strengths and weaknesses of the school take over, but unfortunately this approach ends up coming across as very one-sided. The union representatives essentially become the story's villains, and this stance might rub many viewers the wrong way. In the end, while I admired their intentions, I wasn't even sure I actually wanted the characters to succeed in their quest. 'Won't Back Down' has its heart in the right place but fails to really connect. Though inspired by similar real world events, the characters' goals seem unrealistic and sorely misguided. Despite clear attempts at sentimental inspiration, the movie doesn't offer much emotional investment, and the script gets overwhelmed by bureaucratic maneuvering and clichéd beats. Though I sympathize greatly with many of the frustrations expressed throughout the runtime, the film's examination of the education system is a little lacking. Still, this is an ultimately harmless effort and the movie's hopeful message is well meaning. It's underwhelming, but the flick might be worth a rental to some. 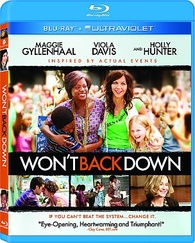 20th Century Fox presents 'Won't Back Down' in a Blu-ray/Digital Copy combo pack. A BD-50 disc and instructions for a downloadable UltraViolet digital copy are housed together in a keepcase. After some skippable trailers, the disc transitions to a standard menu. The movie is provided with a 1080p/AVC MPEG-4 transfer in the 2.35:1 aspect ratio. Marked by strong clarity and gritty texture, the image proves to be pretty impressive. The source print is in pristine condition, and a moderate layer of grain is visible throughout. The picture features sharp detail and an occasionally striking sense of dimension (especially in crowd scenes), fully rendering all of the fine patterns and textures of the costumes and rundown locations. The early portions of the film adhere to a cool, desaturated palette that emphasizes blues, grays, and other dull hues. As the story progresses, however, rich, warm colors start to show up, bolstering the increasingly hopeful tone with some vivid pop (including some particularly vibrant green t-shirts that are worn during the movie's climax). Contrast remains high throughout, offering bright whites. Black levels are deep and inky but shadow detail can crush slightly due to the film's intentionally stylized aesthetic. Some of the movie's stylistic choices aren't always appealing, but the overall video presentation is strong, and the transfer is free of any technical issues. The film is provided with an English DTS-HD MA 5.1 track, an English Descriptive Audio 5.1 track, a Spanish Dolby Digital 5.1 track, and a French Dolby Digital 5.1 track. Optional English SHD and Spanish subtitles are also included. Frontloaded and a bit anemic, this track gets the job done but not much else. Dialogue is well prioritized but can sound a little muffled in a few scenes. The film's opening sequence actually features some creative design work (using background sounds to help paint the classroom as a figurative battlefield), but the rest of the runtime is fairly uneventful. Effects work is mostly relegated to the front three speakers, and the overall soundstage has a rather small scope. Faint ambiance in classrooms, playgrounds, and busy city streets make their way to the rears, but notable directionality and surround use are pretty rare. Crowded rally scenes don't carry the sense of immersion one might expect, and despite the film's inspirational heart tugging, the score's dynamic range never quite soars and bass activity is essentially nonexistent. This is a modest mix and while the audio certainly does the film justice, there are a few areas that could have benefited from a little more kick and auditory texture. Fox has put together a decent but underwhelming collection of supplements, including a commentary and deleted scenes. All of the extras are presented in 1080p with Dolby Digital 2.0 audio and no subtitle options. Commentary - Director/co-writer Daniel Barnz provides a solo track for the movie. The filmmaker offers a steady discussion on the film's inspirations, locations, David versus Goliath theme, and visual style. Real life inspirations are also addressed and Barnz takes some time to defend the movie's criticism of unions. There's a solid amount of production trivia and technical information peppered throughout, but all in all this is a fairly mundane track. Deleted Scenes (HD, 9 min) - Six deleted scenes are viewable separately or together and with or without commentary from the director. These are all mostly negligible additions that were cut for time, but an extra scene showing Nona teaching her class probably should have stayed in. A Tribute to Teachers (HD, 4 min) - Here the cast and crew share stories about their favorite teachers. Some brief behind-the-scenes clips are also shown. Short and fluffy, this is an inconsequential featurette. The Importance of Education (HD, 5 min) - More quick on-set footage is interspersed with clips of the cast and crew discussing the education system and its various challenges. Again, this is mostly uneventful. 'Won't Back Down' is a well intentioned but ultimately misguided effort. The film's examination of the education system is heartfelt but unrealistic, and the characters and plotting are thin and predictable. On the technical front, the video transfer is strong but the audio mix lacks immersion and range. The commentary and deleted scenes are decent but the included featurettes are fluffy and skippable. This disc is a rental at best.